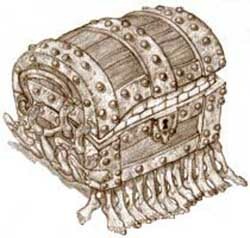 The Multi-legged Luggage (Cistae polypedibus "many footed box") is tamable monster of the luggage family. According to legend, a security guard once spent fourteen hours of his eight-hour workday responding to calls about various unattended luggage. He became so frustrated that heroes could so carelessly forget their luggage and even more frustrated about trying to decipher heroes' illegible luggage tag handwriting, that he announced over the loudspeaker, "if the pansy hero with the pansy pink-purple-yellow-polka-dot-flower luggage doesn't claim it now, I'm gonna take that pansy luggage and use it to bust down your pansy temple." Naturally, it was the last announcement he ever made. The security guard went home inspired to create luggage that heroes could not leave behind. Years passed without success. Eventually, he embarked on a quest to find the necessary materials and found the rare and intelligent Sapient Pearwood tree. He found those trees growing only in places of a vast magical expenditure, such as where a hero has died or where many miracles have occurred. Inspired, he removed branches from the tree and carved the first Multi-legged Luggage. Multi-legged Luggage have greatly reduced the problem of unattended luggage today. When prompted by a security guard, an unattended Multi-legged Luggage will instantly jump up and scurry off to find its owner. Due to the wood originating from magical areas, all Multi-legged Luggage have significant intelligence and a fear of termites. To satisfy demand for "the luggage you can’t lose," many Sapient Pearwood tree have been painfully cut down. As such, the Multi-Legged Luggage also feels the pain and seeks revenge. Despite this, certain Interior Diviners continue to build them for travelers to use in the reasonably long length of time before they become feral. Most people see it as a calculated risk; an exchange of huge storage that will never be lost for the possibility of loss of life. Its attitude to the rest of existence is indescribable, but one could start with 'bloody-minded malevolence' and work up from there. It destroys anything it encounters by trampling it with its 5648 tiny legs. Its inside does not occupy the same dimensions as the rest of Godville and, as such, can be anything up to infinite. The scientific name for the Multi-legged Luggage is Cistae polypedibus and literally means sacred chest (cistae) many (poly) feet (pedi). A hero who has tamed one can put dirty clothes in it, do the hokey-pokey, and open it to find clean clothes smelling vaguely of lavender. It is quite possibly one of the most dangerous monsters to be found roaming Godville. Beware! Every Multi-Legged Luggage is a different gender. Won't stop until it reaches it's goal- whatever that is. This page was last edited on 20 April 2019, at 14:45.